Dismissing the allegations of political vendetta levelled by the opposition parties, Finance Minister Arun Jaitley Wednesday said revenue department acts objectively and conducts search operations only on the basis of material evidence. The Income Tax Department has carried out raids on people linked to Madhya Pradesh Chief Minister Kamal Nath, a JD(S) minister in Karnataka, and a senior DMK leader in Tamil Nadu in the recent past. The searches are linked to suspected movement of hawala money during the ongoing polls season and tax evasion. The opposition parties, including the Congress, have dubbed the raids as politically motivated. Taking note of these raids, the Election Commission in its letter to Revenue Secretary Ajay Bhushan Pandey had "strongly advised" that any action by its enforcement agencies during election time should be "neutral" and "non-discriminatory" and officials of the poll panel should be kept in loop about such actions. "It has become a routine practice to call any action against corruption as political vendetta. Claim of vendetta has never been a legitimate defence in corruption. Those who commit such large acts of corruption have to be judged on the merits of the action itself," he said. Jaitley said none of the two state governments (non-BJP ruled Madhya Pradesh and Karnataka) have replied to the allegations on merits. "An argument is being given by them as to why they are being singled out and their political rivals are not being searched. Is there a Right to Equality that no action can be taken till the opponents are charged? "Revenue Department acts objectively on the basis of material available and take action when they are satisfied that a case of search operation is made out," the minister said. The Income Tax Department, Enforcement Directorate and Directorate of Revenue Intelligence are the executive arms of the Revenue Department in dealing with financial crimes. The seven-phase Lok Sabha election starts from April 11 and counting will held on May 23. 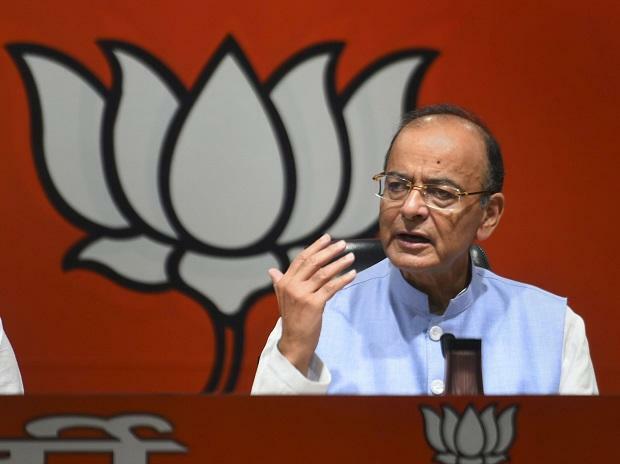 Jaitley said that the act of siphoning out money meant for vulnerable sections of society shows the mindframe of those indulging in such activities. He said evidence has come to light in public space that in Karnataka, allocations made for public welfare to the Public Works Department were being round-tripped by engineers for a political purpose. In Madhya Pradesh, he alleged, that an institutional mechanism has been created where money meant for development and social welfare of the weaker sections were being channelled into politics. Without specifically mentioning the Congress, he said, "They do not even spare those who live in destitution. This is the hypocrisy of Indian politics. After inflicting such injustice they have the audacity to speak of Nyay". In the run up to the elections, the Congress promised to implement a minimum income guarantee scheme, Nyuntam Aay Yojana (Nyay), which assures up to Rs 72,000 a year or Rs 6,000 a month income to 20 per cent of India's poorest families, if the party is voted back to power in the ensuing Lok Sabha elections.